Savory meets sweet for a unique dinner item! 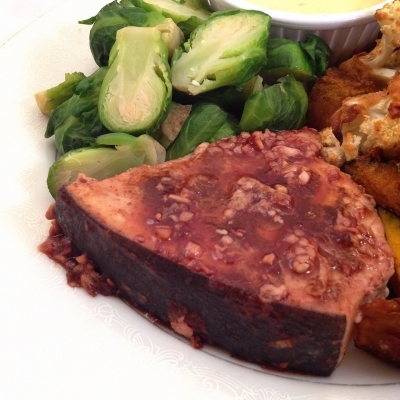 Place the swordfish in a pan sprayed with nonstick spray. Heat the pan on a medium heat. Then add the apple cider vinegar, garlic, and chipotle chili powder. Let it cook for 4-5 minutes on one side until light in color and fully cooked. Flip, and cook the other side 4-5 minutes until cooked through. Then add the sugar free red raspberry preserves to the pan. Let the swordfish cook in this â€“ the preserves will begin to melt and seep into the meat. Flip once more to incorporate the flavors. Once the sugar free preserves have melted and then thickened in the pan, serve!